I have always loved cream puffs and so when I saw these little swans at a party many years ago, I decided to try making them, using a basic recipe, passed down from my Mom. I think the first time I made them was for my daughter’s 1st Birthday! I most recently made these for a bridal shower, but they will adapt to most any occasion. For a baby shower, try making one or two big ones with a trail of smaller ones to represent a family. Beat in eggs, separately, with wooden spoon - until smooth. Fill decorating tube or bag with about ½ - 3/4 c of the batter and, using a #58 writing tip, write out 30 or so (2 ½ “ tall) question marks on a parchment paper lined cookie sheet. (I like to use my air bake baking sheet for this because it won’t burn them from underneath) They will look way too thin, but they puff up to the right size. Bake at 450º F for about 5 minutes and then check and don’t leave the oven until they are just a light golden color, maybe another 3 minutes. Drop the rest of the pastry by rounded teaspoon onto greased and floured (or parchment paper lined) cookie sheets. Bake at 450º F for the first 10 min. Lower temp to 350ºF and bake another 25 - 30 min. Be sure to bake the alotted time even if they look done earlier. Once they are done, poke a small opening with a sharp knife on the side of each ball to let the steam escape. Slice horizontally about ¾ of the way up (not in half) - just the top, and set aside. Fill bottoms. Insert the necks on the right end. If your puffs are a slightly elongated, make sure it’s on a narrow end. If they are totally round, it doesn’t’ matter. For wings, cut tops in half and insert, cut side into filling, so that the wings stand up. Place on shiny silver tray or mirror for lake effect. Dust with confectioner’s sugar, using a small sieve. The puffs can be made ahead and frozen. They can be filled the day before or first thing in the morning of serving. Refrigerate without covering to keep them from softening. Dust with icing sugar before serving. Those are marvelous! Now all I need is a grandaughter so I can make them for her first birthday party! Oh, how cute!! Anneliese, you are always so creative! My birdwatching son would love these! Those look great...very good for a special occasion. Job well done!! They are so beautiful. Lovely. I love cream puffs. . .oh Anneliese. . .do you have one to spare? I think those are adorable ..
Would be superb for a bridal shower; swans mate for life. These swans look wonderful Anneliese! I'm certain that I could not make them, but I sure could eat them! Oh you are incredible Anneliese! Wow...these are amazing! What a beautiful treat those will be for someone...by now I am sure they are all gone! Grin....lovely. And as always..you make it seem so easy! Oh my gosh, that it is prettiest dessert ever!! (And I bet it tastes wonderful too!) I have never seen creme puff swans. Very very cool! Those are the coolest cream puffs ever! Your cream puff swans look just perfect, Anneliese! What a great idea. so cool, they look so pretty, almost too nice to bite into. Anneliese, these are sooo beautiful! 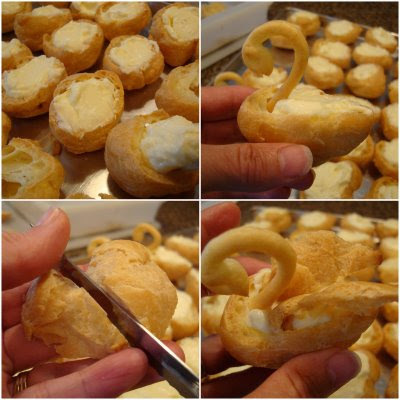 I have made cream puffs for decades - using the same recipe you use... but I have never seen them made like swans. I tried some times ago to made cream puffs gluten-free and didn't like the end result -- now I'm motivated to try again. How lovely! My older daughter asked me recently about how to make cream puffs. Your recipe and photos will be helpful. I have only made the boring kind, nothing special. That is the cutest thing! I've never seen anything like it before - very clever! wonderful!!! My family will gobble these up. And my daughter's birthday is coming right up. Great timing!! These are lovely. We made these for my elder daughter's graduation party, wow, could that be 8 years ago? Had these for our wedding desert over 20 years ago. Were impressive! I love these! Beautiful! I would love to try them! Just a quick question about your cup measures. I live in Australia and am used to weighing amounts for cooking. When you use, say, a cup full of flour, do you spoon the flour into the cup or do you simply scoop the cup through the flour bin? Might sound like a silly question but I have heard that the 'scooping' can compact the flour and therefore not be a really good way to do it. Is this true? 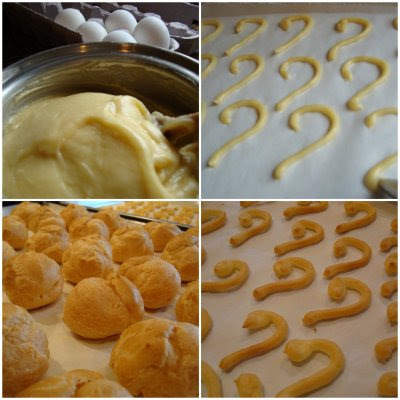 Also, with your cream puff recipe, do you use bread making flour or ordinary cake flour? Thanks. I just scoop into the bin and fill a 250 ml cup. I don't tap it down. And yes. I use ordinary unbleached flour ... the same for pastry as for bread.,,. but I do like to mix in some whole wheat or multigrain for bread. Thanks for your reply, Anneliese. I will try your way. I'm sure it will be a great success. You are all doing a great job by the way. Very inspiring.